rec. 2018, Potton Hall, Dunwich, Suffolk. Volume 1 of Ivan Ilić’s Reicha Rediscovered series was an eye-opener for myself (review) and many others, and these titles are proving to be a hit with a surprisingly wide audience. Once again we are treated with superbly produced and annotated première recordings of music that was unfashionable in its day and neglected since, but can now be heard with ears freed of prejudicial crust. The Études dans le genre Fugué or Studies in Fugal Style were intended as pedagogical exercises for keyboard players and trainee composers. The typical pattern of these is a fugue preceded by a prelude, though Reicha is not always consistent in this. Reicha’s mantra for teaching composition was counterpoint, of which the fugue is the greatest test of a composer’s skill. 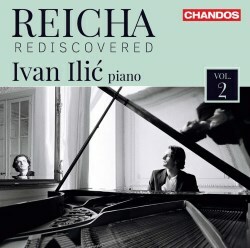 In his booklet notes, Ilić points out the myriad ways in which Reicha was able to make his fugues into “an intense cognitive experience”, bringing in hints of other composers such as Schumann or Mendelssohn, and allowing himself latitude with the rules of the fugue as generally set out by J.S. Bach. Partial entries of the subject or overlapping them in stretto to raise the musical temperature and, as in some of the preludes, intervening with surprise changes of one kind or another. Reicha favours major keys in these pieces, lending them an up-beat feel to a set of pieces that already has plenty of joie de vivre. In short, there is variety and fascination enough in this collection, which brings us 1-13 of a set that runs to 34, so there is plenty more to expect in future volumes. Listening to these pieces requires a certain openness of attitude, with ears prepared to find the interest in Reicha’s subtle treatment of apparently almost naïve material, as well as being prepared to share his sometimes unconventional journeys in counterpoint. Reicha wrong-foots us in all kinds of ways but, from my point of view at least, in no way as to irritate the listener. The educational aspects of this music can be borne in mind but are also easy to ignore while revelling in amusing corners such as the teasingly playful dotted rhythms of the Andante Maestoso tenth prelude, followed by the music-box effect of its partner piece, which is by no means a fugue. This edition is being shadowed somewhat by another ‘Complete Piano Works’ on Toccata Classics played by Henrik Löwenmark. Other than sampling the first two volumes from their website I have no real qualitative remarks to make, other than noting that Ivan Ilić seems more secure on a purely technical level. It will be interesting to see how this battle of world premières pans out, though the two labels have avoided treading on each other’s feet so far.